In my studio, I always want a new game to make reviewing key signatures more fun. We have races and do worksheets, but I’ve been brainstorming a few new key signature ideas. So today, I’m sharing my first one! 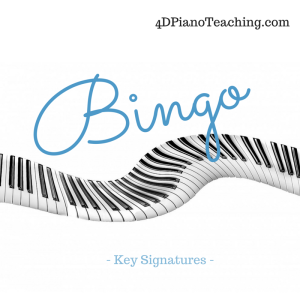 Key Signature Bingo – pretty easy right? It has Major and minor keys with a free space on each card. If you look at the call list at the back of the pdf file, you’ll see I used every Major key on the Circle of 5ths but not every minor key possible. I wanted to simplify the possibilities a little bit for my students. If you want to change that here is the link for the bingo generator I used. We play this game with regular key signature flashcards. I have several sets of cards, all the same size, so I have pulled out the correct ones to match the call list. Major and minor are chosen by the student depending on what they want to fill in their card (since it will be the same key signature and could go either way). I do ask students to name it out loud, usually making them wait about 10 seconds so everyone can do it on their own. Some students just work slower so I hate to have the quick ones blurt out the answer! Also, this is a really fun group class game but it’s also fun in private lessons or at the end 5 minutes combined with one incoming student and one outgoing student. Hope you enjoy it!